Platters and gift bags can be picked up at the shop or delivered to your house within a 20 mile radius. For pick up give us at least a day’s notice and for delivery give us at least 3 days notice. No matter what you order we will give you a call at the number you give us to discuss payment and order details. 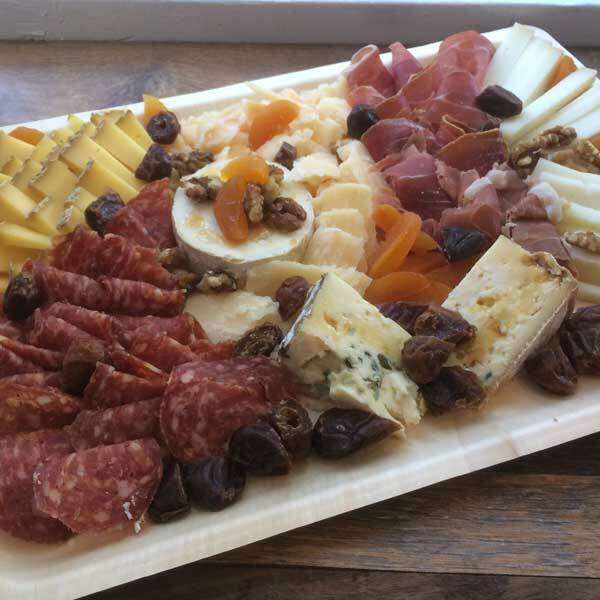 $25 platter (not available for delivery) 4 oz of 2 cheeses and one charcuterie with crackers, dried fruit, nuts for dressing, prepped and plated in a beautiful presentation. $75 platter – either – 6 oz of 5 cheeses and 6 oz of 3 charcuterie, or 10 oz of 3 and 2 and all the accompanying accoutrements. Good for 10-15 people. A la carte – we can create any platter you want. Just tell us what you are interested in and we can design this together. Don’t want meat? We can do that! Don’t want cheese? First we’ll ask you what the hell is wrong with you, but we can do that too! You can use the above options as a starting point for pricing. Just choose the one closest to the number of people you want to serve and when we call you to discuss (which we do for all platters) you let us know! Platters for larger groups can also be accommodated. Pricing will be worked out accordingly. Platters and gift bags can be picked up at the shop or delivered to your house within a 20 mile radius. For pick up give us at least a day’s notice and for delivery give us at least 3 days notice.